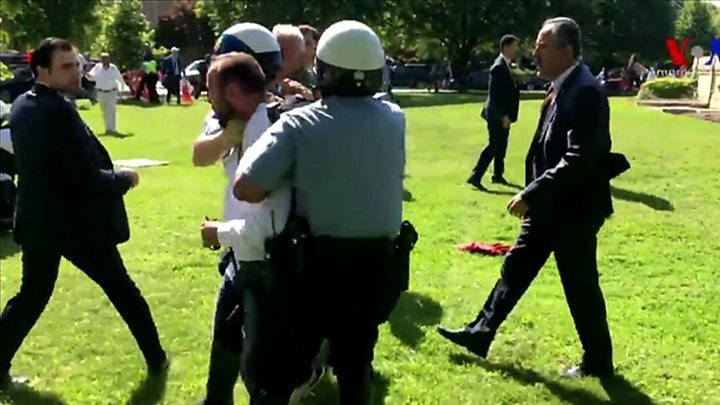 Nine people have been injured and two arrested outside the Turkish ambassador's residence in Washington, DC, after a brawl broke out between supporters and opponents of President Recep Tayyip Erdogan. The Turkish leader met US President Donald Trump for talks on Tuesday. Hours after the meeting, around two dozen protesters gathered and traded insults with Mr Erdogan's supporters. Video footage from the scene shows several people with bloody injuries. Some US reports claim President Erdogan's protection officers were drawn into the fracas after he arrived to visit the ambassador. Demonstrator Flint Arthur, from Baltimore, told CNN: "We are protesting [Mr Erdogan's] policies in Turkey, in Syria and in Iraq. "They think they can engage in the same sort of suppression of protest and free speech that they engage in in Turkey. "They stopped us for a few minutes ... but we still stayed and continued to protest Erdogan's tyrannical regime." He accused the pro-Erdogan group of breaching police lines and attacking protesters at least three times. Police intervened to end the violence, and the injured were taken to George Washington University Hospital. The Turkish president's visit to Washington has raised eyebrows in some quarters, with opponents citing his use of mass arrests to silence dissent. After their meeting, Presidents Trump and Erdogan told a joint press conference they had pledged to strengthen bilateral relations. "We've had a great relationship and we will make it even better," Mr Trump said. "We look forward to having very strong and solid discussions." However, Mr Erdogan reiterated that he will never accept a US alliance with Kurdish forces fighting in Syria. "There is no place for terrorist organisations in the future of our region," he told journalists. Why is Turkey hostile to the YPG? The US decided to arm the Syrian Kurdish YPG militia earlier this month. Mr Erdogan also said he had pressed the US to extradite cleric Fethullah Gulen, whom he blames for the failed coup against him last July.